We partner with clients to help their leadership teams have strategic (and necessary) conversations – the conversations they all know they need to have, and the conversations they all seem to be unable to have. Because there’s usually that “elephant in the middle of the living room.” That thing that everyone knows, sees, and talks about behind closed doors or in separate offline discussions, but that no one is willing to bring up in front of the leader or with everyone in the same room. And that elephant can be the death of projects, teams, relationships, and yes, even companies. When everyone, or nearly everyone, knows that there’s something wrong, but no one is willing to be the bearer of bad news, things fester and pollute. Culture can be ruined; efficiencies can be lost; outcomes can be doomed from the very start. And no one is willing to talk about it. There’s a reason we have a common saying, “Don’t shoot the messenger.” When someone does speak up, quite often people turn on them. Because we often shoot the messenger, no one is willing to say what they really think and see. Don’t shoot the messenger – if you want people to tell you what they think and see, then you have to be open to what they think and see. When someone shares something you don’t want to hear, manage your reactions, resist any outbursts, and thank them for telling you. 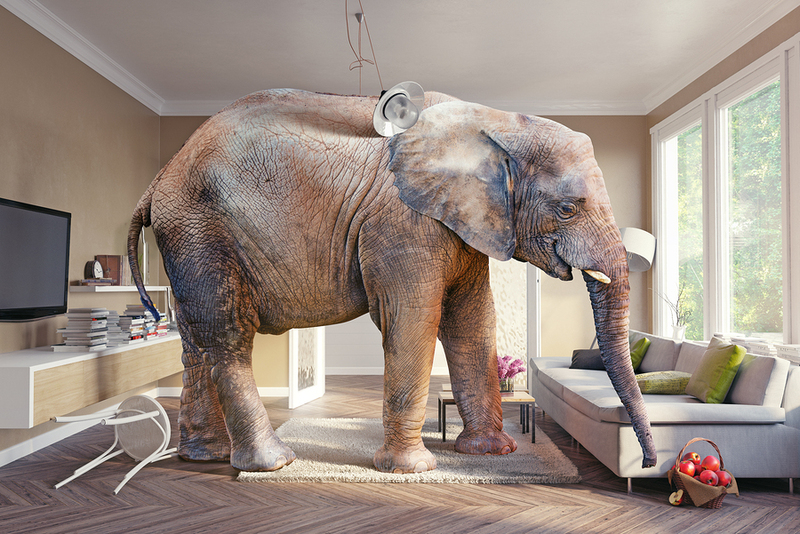 The “elephants in the middle of the living room” can get in the way of successful – and enjoyable – relationships, projects, and business outcomes…unless you know how to coax them out and address them. And while an outside facilitator may sometimes be necessary (and almost always helpful), there are ways to help your team have the conversations they need to have, if you’re willing to invite and reward discourse and disagreement. How have you successfully aired the things that need to be aired? For support in having the tough conversations (and if you want to learn about bringing Chatsworth Consulting Group in to help you), contact Lisa at lkohn@chatsworthconsulting.com.